The Anime Archivist: Video Backlog: "Pixies"
My childhood years (the 1980’s) were spent growing up in the country. The only music I heard was on AM radio, filled with top 40 hits and an odd collection of hits dating back to the 1950’s. I did like some pop music (mostly Duran Duran, Inxs and a few others), but thanks to ABC TV through Rage, Rock Arena and various Saturday morning music video shows, I was introduced to alternate rock and the emerging sample based music such as the early UK house scene (KLF, Coldcut, Bomb the Bass, Beatmasters) and of course hip hop music from the US. 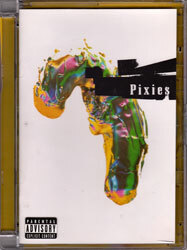 I first heard “Here Comes Your Man” by the Pixies on Rock Arena on ABC TV in 1989. The music video was completely daft with lead singer Black Francis (Frank Black, or Charles Thompson to his mom and dad) and bassist Kim Deal not miming at all to the song, just opening their mouths when the lyrics where sung. I didn’t get it. I don’t think it was until they released “Dig for Fire” until I really got what they were on about, and by the time the “Alec Eifel” video appeared on Rage (do really think any of their music was played on local radio?) I was fan and bought as many of their CDs I could that were listed in the local record shop’s catalogue. And then the bastards broke up, just as I became a fan of their music. I think the real shame with the Pixies and a number of other bands of the 1980’s, is they never got any exposure in mainstream media and didn’t get any recognition outside Europe which they so deserved. Probably this is in part the Pixies fault as they refused to do any video as such. Only one video (“Alec Eifel”) has them miming properly and looks like a real alt rock video. The rest have them doing other things like playing live or the infamous “Veloria” video which has them running out of frame in one continuous slow motion shot. This video compilation, released in conjunction with a “best of” 4AD compilation (“Wave of Mutilation”), around the time they reformed and toured and toured and toured (still no sign of a new album, which is probably for the best), is divided into four parts. The first and probably the best part of this disc is the live show in London from 1988. They’re a rather ordinary lot on stage (in some segments on this disc, it looks like four people off the street just came in and stated playing on stage) with absolutely no stage theatrics, but they certainly know how to make a nice racket. There’s a good sampling of “Come On Pilgrim” and “Surfer Rosa” here, as well as covers of the Beatles “Wild Honey Pie” and fan favourite “The Lady in the Radiator Song (In Heaven)”. The second section covers their music videos, including the posthumous “Debaser”, which a bit of a dreadful clip conceived by 4AD with no involvement from the band. The third bit is the fairly good “On the Road” which is a compilation of camcorder footage taken by Myles Mangio, who was a key part of their tour staff on their European and US tours of 1989. There’s some funny stuff here and it shows that drummer David Lovering was the clown in the band. At one point he gets the address of a 12 year old girl in Italy, which Kim then confiscates. Kim Deal herself proves to be the most interesting of the group. She’s particularly hilarious in this section of the DVD, speaking bad German and buying woeful touristy gifts in Europe for her family. Towards the end of this section, it does become a bit tedious and a little dull. Guitarist Joey Santiago barely says a word and Charles is Charles really. The fourth part is Channel 4’s hour long documentary “Gouge”. While it does have some really interesting interviews with Thom Yorke, David Bowie, PJ Harvey, Bono, Badly Drawn Boy and others, it’s not particularly enlightening. None of the Pixies interviews or with producers Gil Norton and Steve Albini tell us much about the band or the recording process for their records. A lot of stuff seems to be missing or glossed over, like how they almost broke up in 1989, Charles publicly ending the band in a radio interview without the other members knowledge, and Kim Deal’s absence in the documentary is rather conspicuous. Best part here is Joey Santiago getting his dues from a number of big artists for his underrated guitar work and Charles admitting he had some “UFO experiences” when he was a child and recounting a story of when he was told he could “holler” by an old bloke. While I love the band’s music, their videos aren’t very good for the most part. But then again they were about the music, not about their image or stupid stage theatrics. The concert section of this release proves that. That is certainly the best part of this DVD. The documentary part is more about what a bunch of modern day artists and a couple of annoying jurnos whose opinions I could care less about. I’m going to give the disc 7 out of 10, mostly for the concert. Video Backlog: "Detroit Metal City"